Posted by Pat Sonnenstuhl on Mar 27, 2016 in Blissborn Babies and Birth Stories | Comments Off on Baby Hannah: Welcome ! Just sending an update to let you know we had our little girl! Hannah born March 2016. We could not be any happier! I wanted to share a little about our experience as encouragement as a success story that you’re welcome to share Pat. We were able to follow our birth plan and things went smoothly. Labor was actually WAY shorter than we anticipated and the Blissborn was super helpful. My contractions started off fairly intense & close together right away which threw us off. I was able to get a lot of support from the Blissborn & it was so much so that my husband didn’t realize how far along I was & was surprised when I told him I wanted to go in (thinking – but to his credit not saying – it may be too early). 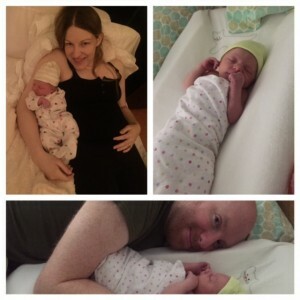 My body knew it was time – we were at the birth center less than an hour before Hannah was born! As there was a health concern, we did do two membrane sweeps + several gentler things to encourage labor but no induction! I was getting quite anxious and had just had appointment with midwife (Monday afternoon ) & decided to do castor oil shake on Wednesday. I was feeling so relieved because my midwife was so confident that it would work (because I was already 3 cm) and because I wasn’t afraid of it. I didn’t react well to the membrane sweeps but I’ve done bowel prep and while it’s not comfortable I know what to expect & that I can handle it. Bought the castor oil & went home feeling very relaxed now that we had a plan… And my water broke!